A Day Late and A Dollar Short: Fox Theatre - Rock the Block Party! Fox Theatre - Rock the Block Party! 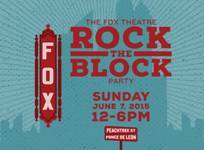 Sunday, June 7 12:00 – 6:00 p.m.
WHAT: For the first time ever, The Fox Theatre will be taking over Midtown for a FREE block party. In honor of the Atlantans who saved the Fox 40 years ago, we invite you all to Rock the Block with us! The block party will take place rain or shine and is free and open to the public. 12:00 PM – The Fox Theatre ROCK THE BLOCK Party Parade featuring The Seed & Feed Marching Abominable! For more information, visit foxtheatre.org/fox-theatre-block-party. The celebration is a thank you to Atlanta for supporting the Save the Fox campaign in 1974-1975 and an opportunity to share the icon with a new generation of fans. In 1974, the future of the legendary Fox Theatre was uncertain. Citizens rallied to “Save the Fox” and raised $1.85 million to restore the beloved Atlanta landmark, resulting in the Fox’s triumphant return in 1975 as an opulent performance venue. In Midtown at the intersection of Peachtree Street NE and Ponce de Leon Avenue, an area that historically represents the heart of Atlanta. Both streets at the intersection will be closed to vehicle traffic; the main entrance will be at Peachtree Street NE and 3rd Street NE. *Please take Marta or Uber, if possible. Parking is extremely limited.